RRP £41 but £17.91 delivered using code ESCENTUAL20 to reduce the sale price. Code gives 20% off site wide. Clarins Tonic Body Balm 100ml: A wonderfully intensive balm for skin that needs a pick-me-up. The body feels comforted, toned, refined and incredibly soft to the touch. Clarins Exfoliating Body Scrub For Smooth Skin 100ml: An exfoliator that refines the skin's texture, buffs away dead surface cells and stimulates cellular renewal to reveal firmer, smoother and softer skin with a boosted natural resilience to external aggressors. Clarins Relax Bath & Shower Concentrate 100ml: This soothing bath gel calms, cleanses and comforts skin, whilst de-stressing the mind and senses after a long day. 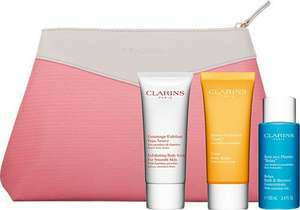 Clarins Vanity Bag: A generously-sized, elegant vanity bag that will accommodate all of your beauty essentials. Looks like a good deal to me!